Posts Tagged "Sonya Dove for ICA"
Home » Posts Tagged "Sonya Dove for ICA"
The Ever-Expanding World of Hair Color was explored at the Sonya Dove Intercoiffure Color Council Show at their recent two-day Atelier in New York City. 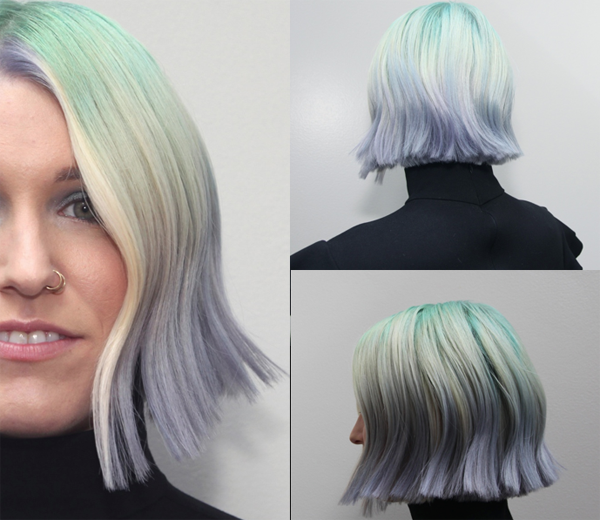 This colorific subtly shaded one length straight bob was in pretty pink, blue, teal, mint and was styled with a juxtaposition of bends and sharp lines. The hair was pre-lightened, Wella Fresh Create was used to customize the waves, a 2″ iron helped to create the bends, and the hair was finished with Sebastian’s Shaper Spray.